It’s been one busy year along the I-39 Corridor and its surrounding counties. In addition to this year’s new developments and ongoing construction, technology is also playing a pivotal role in the Corridor, changing the future of manufacturing. One example is Northern Illinois University’s business school’s highly regarded Department of Operations Management and Information Systems (OM&IS) in DeKalb, Illinois. “That is valuable for logistics and distribution planning, as well as implementation when moving between facilities and getting to market timely and cost-effective, and maximizing efficiency of warehousing distributions,” Paul Borek, executive director of the DeKalb County Economic Development Corporation, said of the program. 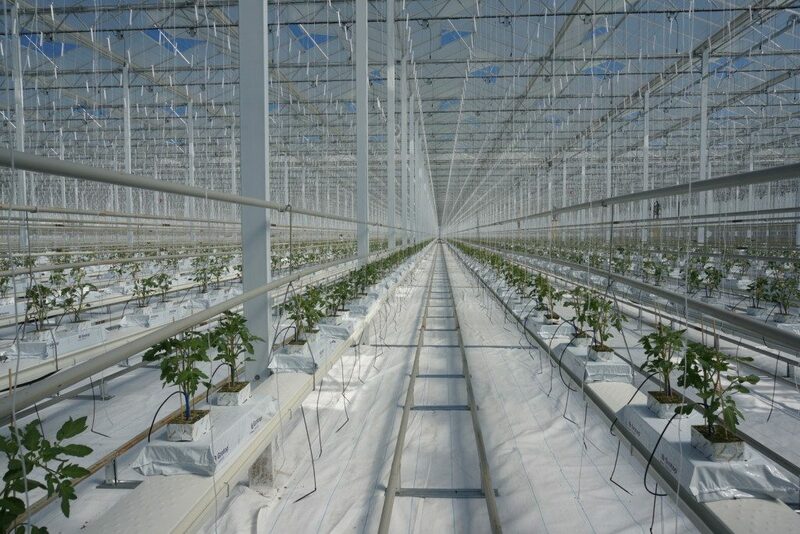 In a technological and sustainable effort to grow fresh produce during the treacherous Midwest winters, MightyVine, a hydroponic farm, has built a 7.5-acre, greenhouse in Rochelle, Illinois to grow tomatoes and vegetables for distribution in Chicago and the Midwestern market. The industrial venture, which estimates harvesting up to 4.5 million pounds annually, is an $11 million project being back from more than a dozen individual investors. Winnebago County has been one of the corridor’s most active counties, accounting for many of this year’s major development projects. Two developments announced last year have officially opened in Rockford County, according to Hopkins. FedEx’s new 186,000-square-foot distribution center at Rock 39 Industrial Park recently opened its ground operations, and All World Machinery Supply Inc., a $3.6 million investment opened its new facility in Roscoe at the intersection of I-90 and Rockton Road. In July, the Greater Rockford Airport Authority began groundwork at Chicago Rockford International Airport, for the new $40 million, 201,000-square-foot AAR Corp. jet maintenance facility. Opening in 2016, the facility is expected to bring 500 jobs when it opens. “That’s something significant that’s coming in, and the facility they are building there is phenomenal,” Dennis McCarthy, national business development director at Rockford Area Economic Development Council, said. Also in July, Woodward Rock Cut Campus, a manufacturing and office complex located in Loves Park, held a ribbon-cutting with roughly 1,500 people in attendance to celebrate the new 450,000-square-foot facility. According to sources familiar with the project, approximately 2,200 full-time employees will work at Rock Cut and Loves Park campuses by 2021. Woodward makes and services energy control systems used in aircraft and vehicles, turbine and piston engines, and electrical power equipment. The industrial park utilizes specialized plants to reduce groundwater pollution. The county has also been active in its educational systems, creating new opportunities for students with the addition of new facilities. Rock Valley College’s new aviation maintenance training facility was recently completed and opened just in time for the start of fall classes. This $5 million, state-of-the-art Aviation Maintenance Educational Facility will house a two-year, FAA approved degree program and an Airframe Powerplant mechanic certification program. According to the college, the program 81 first-year and 35 second-year students are currently enrolled. 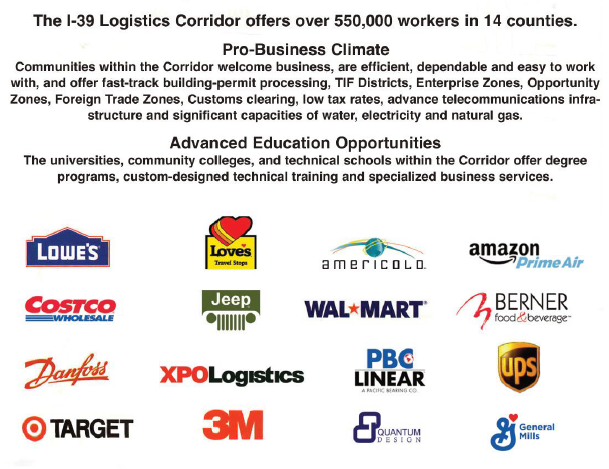 Additionally, Park-90, a 220-acre industrial and corporate park on the northeast corner of I-90 and Route 173. A total of 30,000 square feet is currently available, and acreage for sale, or a build-to-suit. Businesses currently in the park include HMC Products, TH Foods, SCP Distributors, Kaman Industrial Technologies, and Catching Fluid Power. And recently announced, Rockford Mercy Health System plans for a $400 million destination medical campus on its land at the southeast corner of I-90 and Riverside Boulevard. As of September, DeKalb County has more than 1.2 million square feet under construction valued at more than $60 million. Due to the county’s significant increase in development over the past year, industrial vacancy is less than 5 percent. This year, Win Aviation, a provider of aircraft and engine sales, aircraft parts, fuel and maintenance, has completed a new 15,000-square-foot airplane hangar at DeKalb Taylor Municipal Airport. 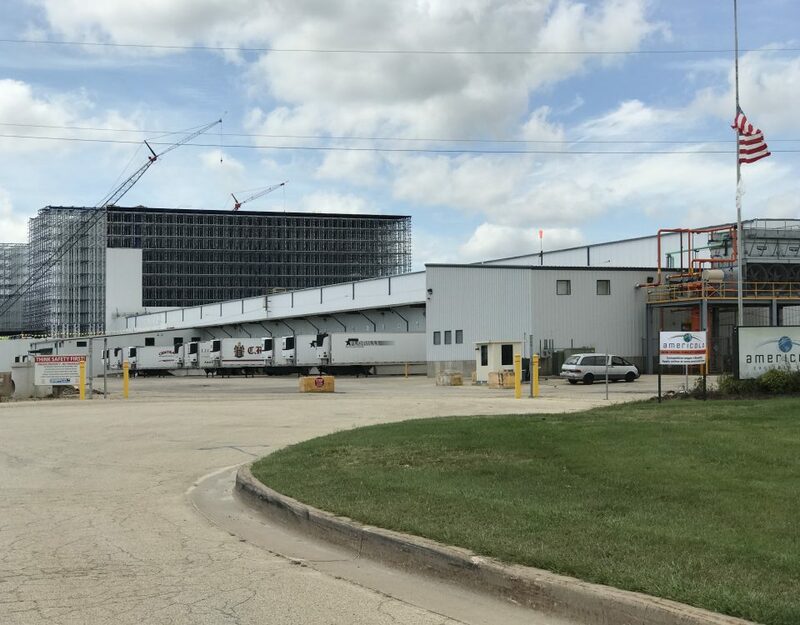 At the top of the list of current largest construction projects in DeKalb is 3M’s expansion in Park 88—a 978,000-square-foot distribution center combining its DeKalb and Sycamore facilities, with a capital investment of $40 million. Following 3M is IDEAL INDUSTRIES, a developer and manufacturer of electrical supplies and tools, and its 220,000-square-foot manufacturing plant in Sycamore Prairie Business Park in Sycamore, Illinois with a capital investment of $18 million. 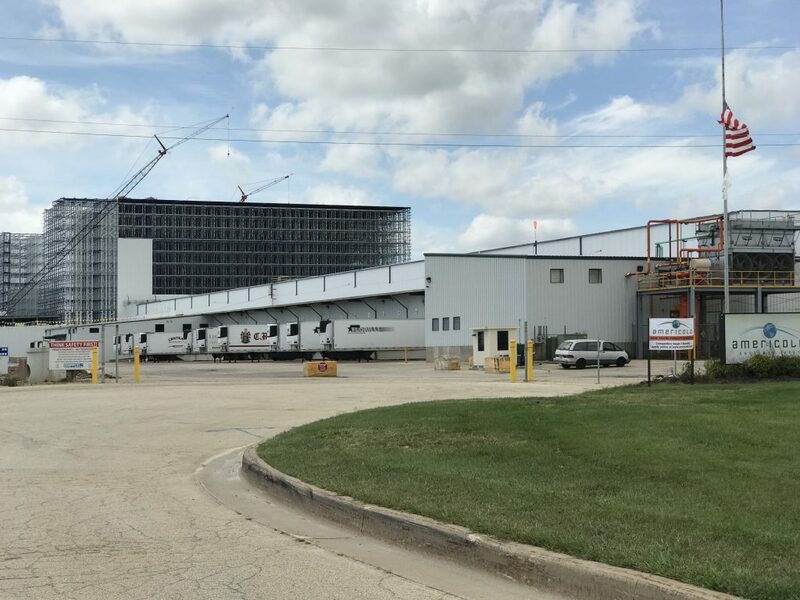 Currently in the process of completion, Custom Aluminum Product added a 37,500-square-foot expansion to their 400,000-square-foot manufacturing plant in Genoa, Illinois. For the first time, DeKalb County was approved for designation as an Illinois Enterprise Zone, and voted to designate 40 new zones throughout the state. According to Paul Borek, executive director at the DeKalb County Economic Development Corporation, these are subject to certification throughout the state in conjunction to budget discussions. Borek said Enterprise Zones afford qualified industrial projects accelerated development incentives, including sales tax exemption on construction materials, sales tax exemption on manufacturing and pollution controlled equipment, exemption on state utility taxes, and coordinated local property tax abatements. Borek noted that there is an abundance of labor availability due to the extensive and diversified manufacturing and distribution operations in the corridor. “Economic development organizations in the I-39 Corridor are working with schools and the industry to make students, educators and parents aware of creative and rewarding career opportunities in manufacturing and industry,” he explained. One example is the DeKalb Ogle Workforce Development Consortium, which has gained participation in industrial career programs at Kishwaukee College. Programs include automated engineering technology, certified production technician, welding, diesel mechanics, and logistics and trucking. And while very little industrial space is available, Borek said some significant opportunities still exist, like the 30,000 to 200,000 square feet of cost-effective manufacturing space in Sycamore Industrial Park. One of Rock County’s largest announcements this year was Dollar General‘s proposed 1 million-square-foot retail distribution center for Janesville, Wisconsin. The company selected its new location due to a variety of factors, including its first-class infrastructure. It is said that the company will bring more than 550 jobs with its $75 million project. The Janesville City Council approved a tax increment financing agreements with two companies in July, for a building housing a metal fabrication company. The two deals are worth roughly $2.5 million in tax incentives and is slated for completion by end of year, bringing 90 jobs to Janesville. The 208,000-square-foot facility will be owned by 3800 Enterprise, Inc., according to the Rock County Wisconsin Development Alliance. A.M. Castle, currently headquartered in Oak Brook, Illinois, will lease the space. Additionally, R+L Carriers, Inc., a U.S.-based Global freight shipping company, had the grand opening of its 100,000-square-foot Janesville Service Center in February. Meanwhile, ConAgra executed a lease this summer for 140,000 square feet at 1 Reynolds Drive. The 422,000-square-foot property purchased by Kaiser Group in 2009, has undergone renovations to its interior and exterior. Rock County Wisconsin Development Alliance said that due to these renovations, the former aluminum wheel manufacturing plant has been made into a Class A industrial and warehouse facility. In March, Ecolab, Inc., a global leader in water, hygiene and energy technology services, signed a long-term, 13-year sublease at the Gateway Business Park for 244,233 square feet. The park is located at the I-39/90 and I-43 junction.